Right now, in New England, there is a blizzard occurring. It’s gonna be 80 degrees Fahrenheit today (which is 26.666 Celsius). It’s been a warm winter and an early spring. So please don’t use the timing I use for your plants. Anyway, this post is also an update on this story. The background. 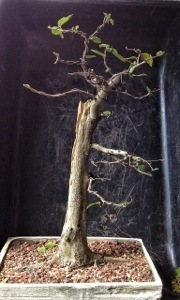 I had gotten the tree at last years (2012) Joy of Bonsai (Kawa Bonsai Society) from Smitty’s Bonsai. I reduced it down from a big nursery can into the training pot it is in and, in August of last year, did the initial work on it. Not too much different huh? One reason why; the time of the year I did the styling. Up there are the views of all sides. 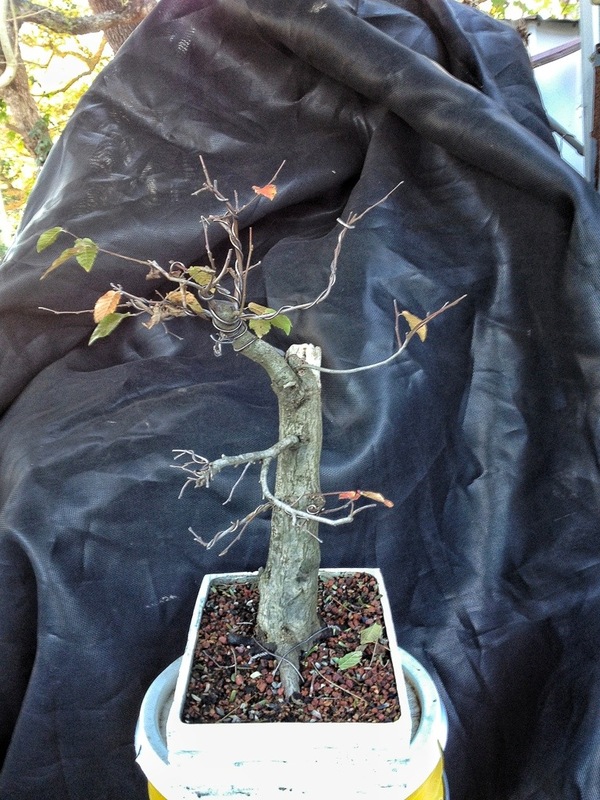 First step is to remove last years old leaves, and cut off any branch dieback. 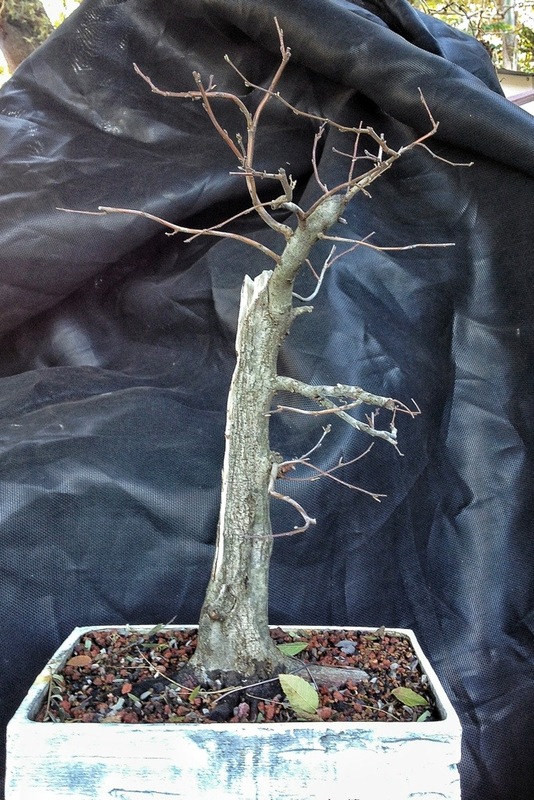 The worst tree for dieback is the crepe myrtle. 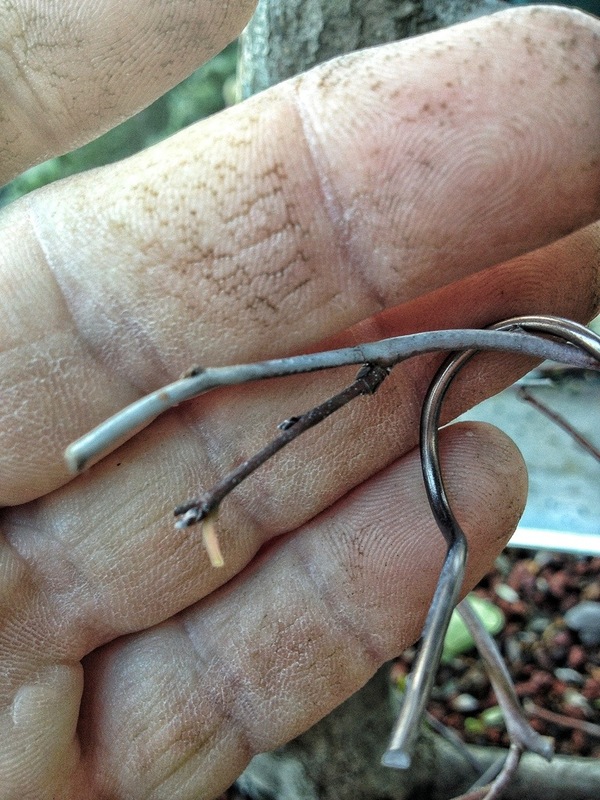 The hackberry is pretty bad too. This one had a few issues. 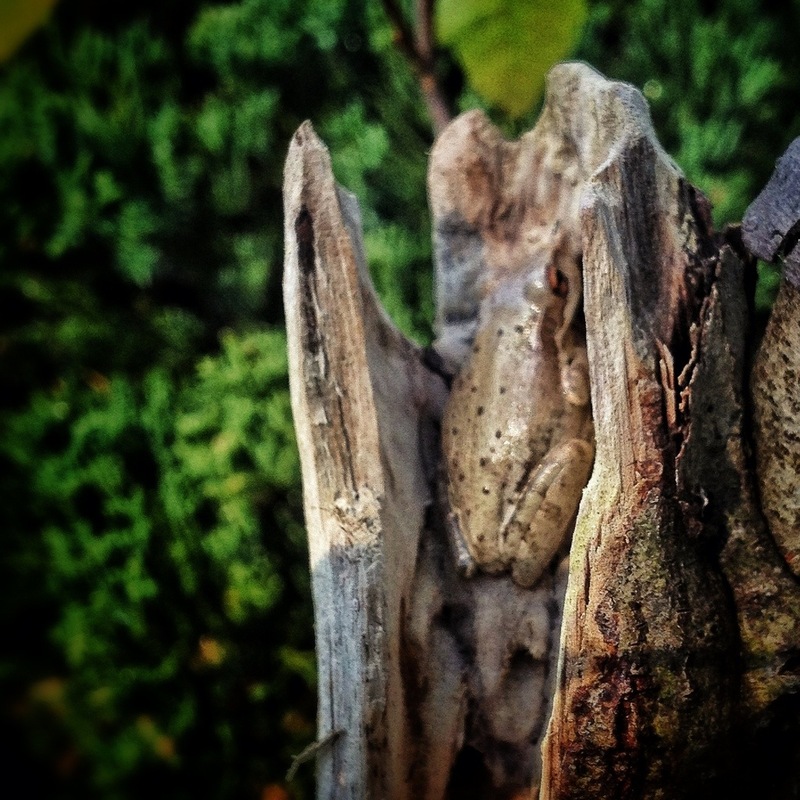 But everywhere it had died back it had grown new shoots replacing the dead ones. All cleaned up. 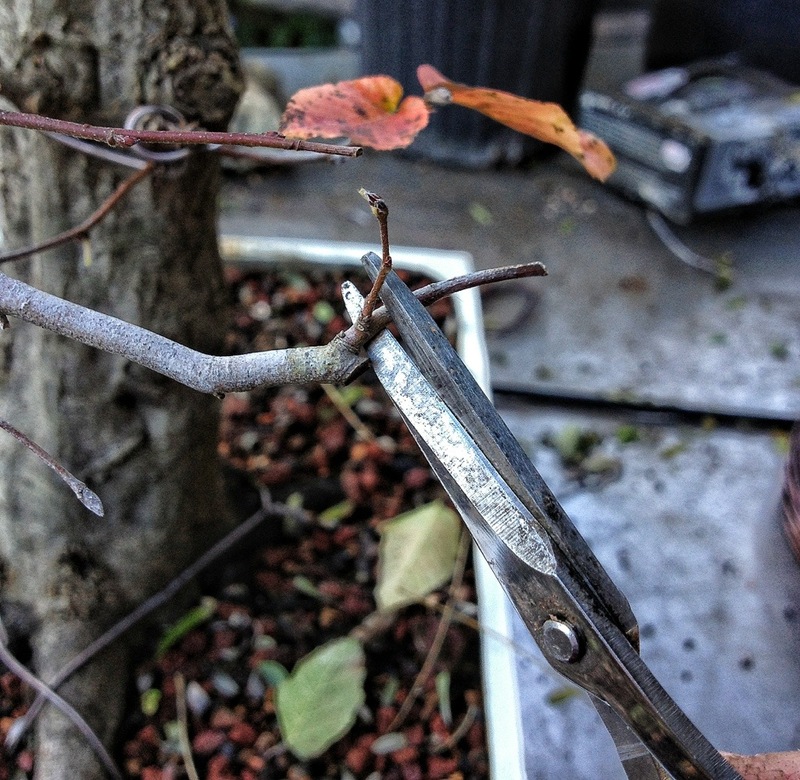 Now some directional pruning. 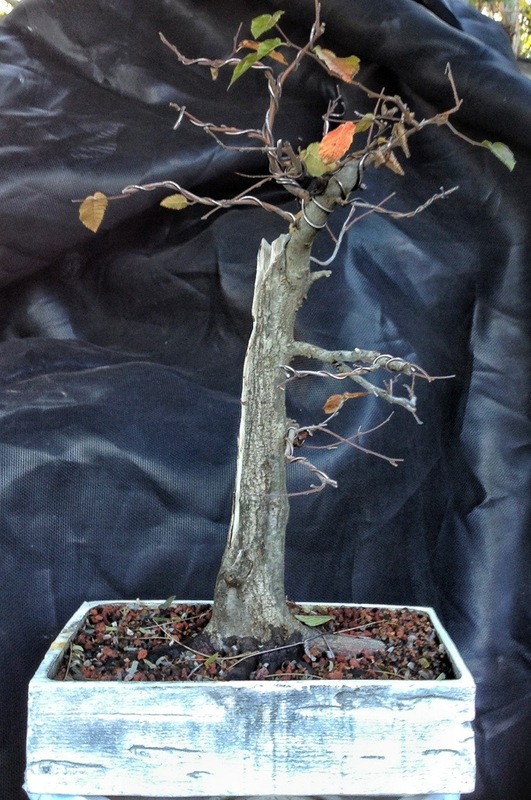 The left branch had grown long and well. I need to fill in the space just below it. I could wire it but there would be little taper to it if I did. 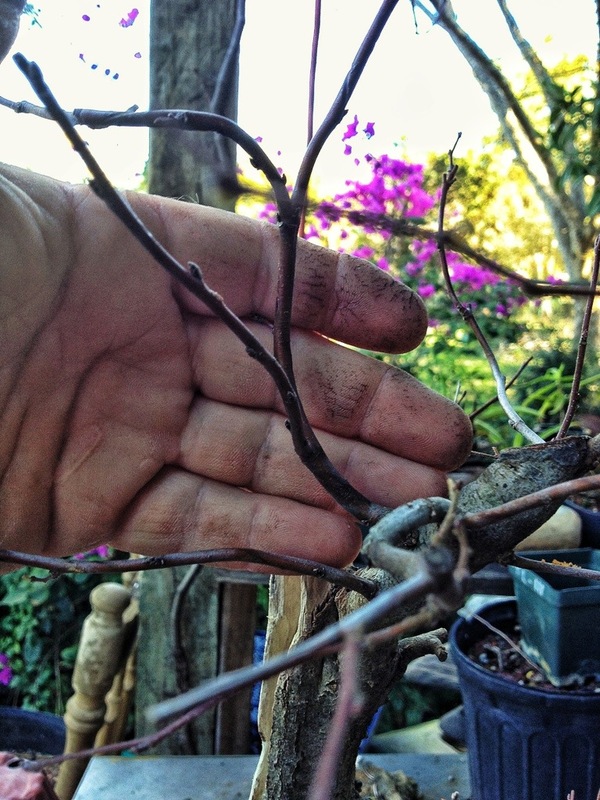 at the bud just above my thumb, I will achieve the same thing. It’s very simple. 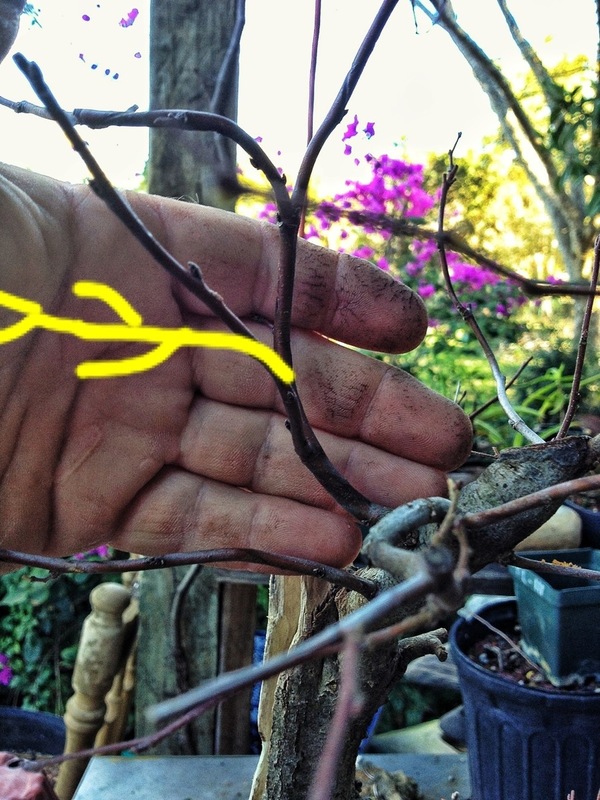 If you wish the branch to go left (or right or up etc) just cut the branch back to the bud facing left. 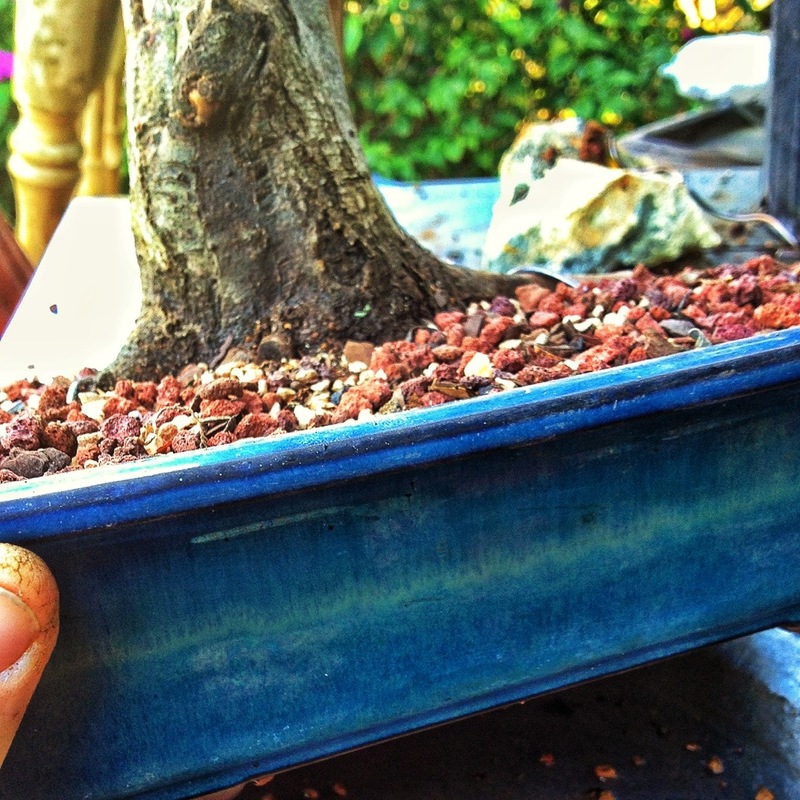 Lets see about repotting…..is the tree ready? Time to dispel a common myth. 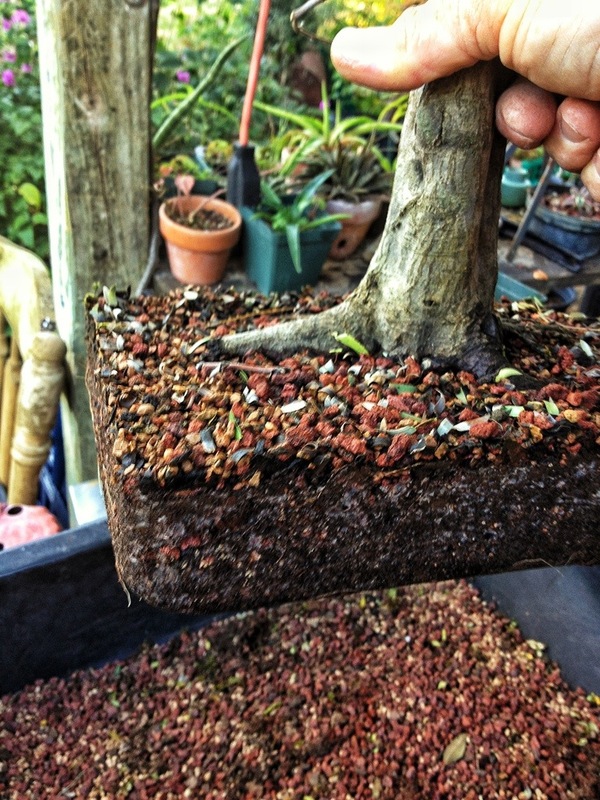 The reason why we repot is to give the tree space to grow and the keep the feeder roots close to the trunk. Think of a tree like it is a drinking straw; (this is very simplified so if you wish to “correct ” me, please do. We all want to know the breadth and depth of your knowledge….) try this- place a straw in a drink and blow over the top of the straw at the opening. The liquid (hopefully its a margarita or daiquiri, I could use one about now) will rise to the top of the straw. 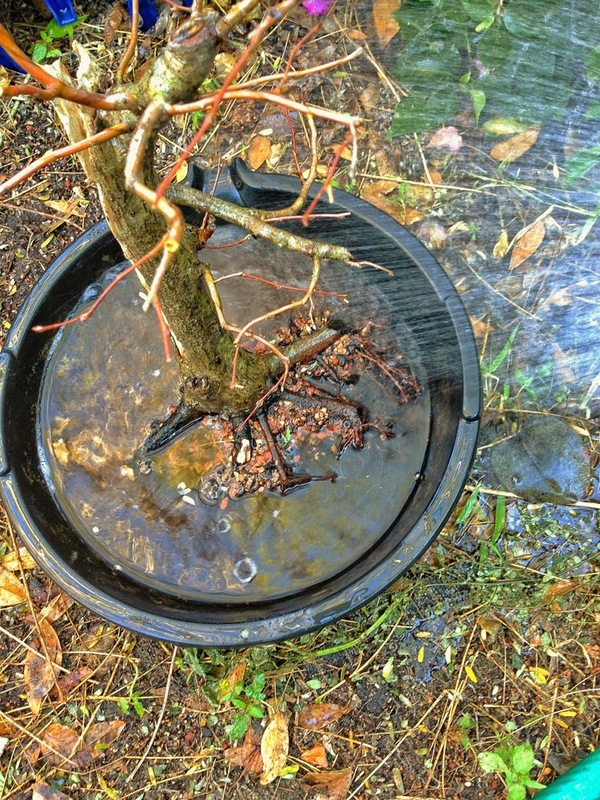 This is how the tree transports water from the roots to the leaves (like I said, very basically, most readers don’t care about differential barometric pressures and viscosities and such. I just gave my readers an excuse to drink an adult beverage through a straw. I know someone will say “that’s not right, it’s this way…waaa. Go easy on me). 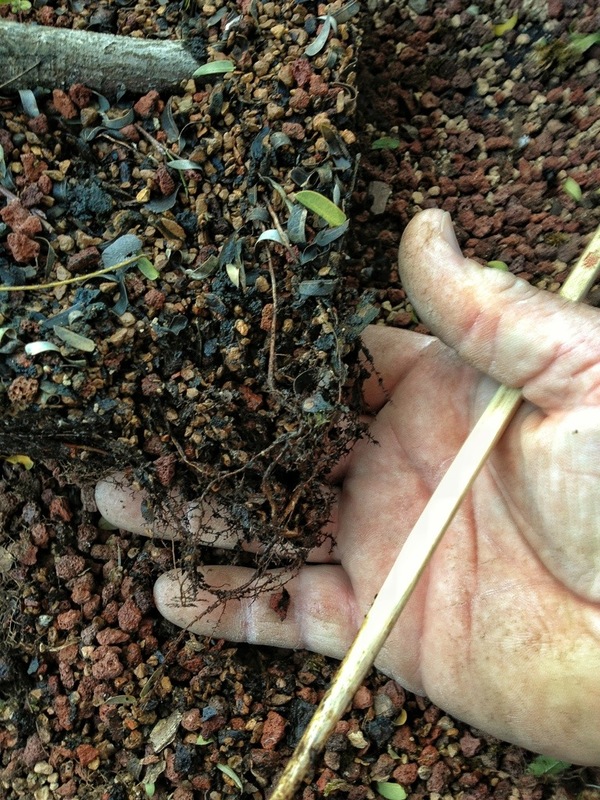 By keeping the roots closer to the trunk, we make this process (called transpiration) easier for the tree. At what time of the year do we repot? 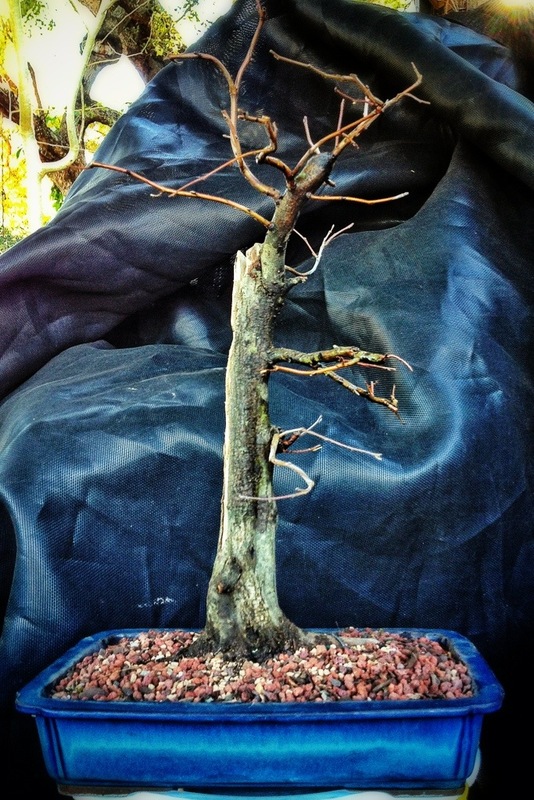 It is different for each tree. 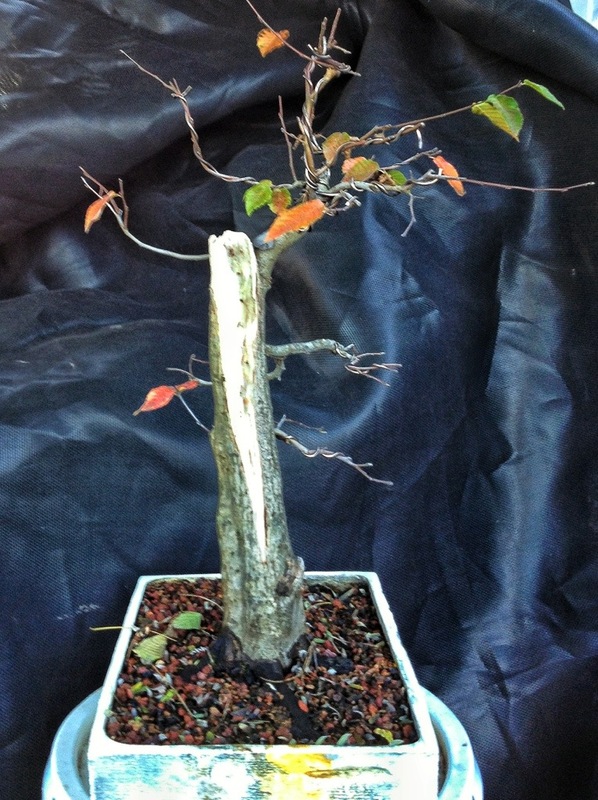 A deciduous tree (like this hornbeam) I repot just before or as the leaf buds are swelling. 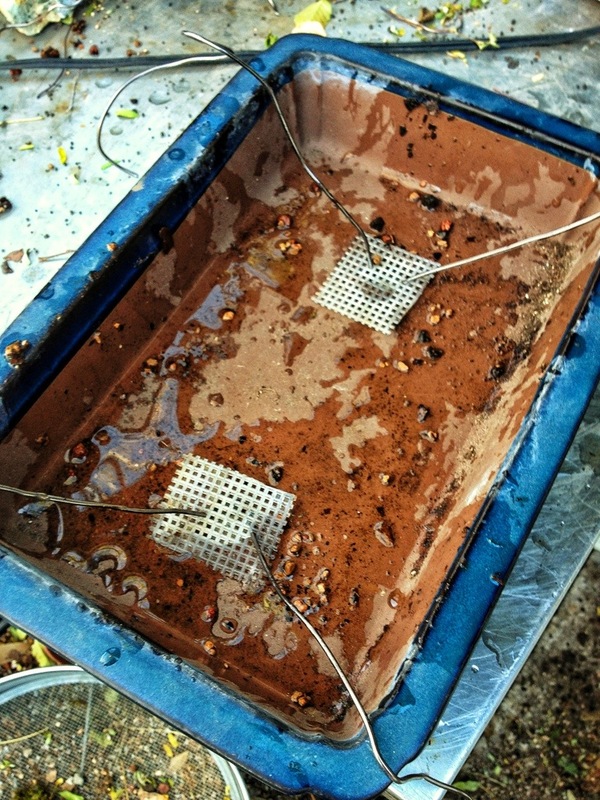 The reason is, this is when the roots begin to swell and start putting out new feeder roots (the only ones that matter. 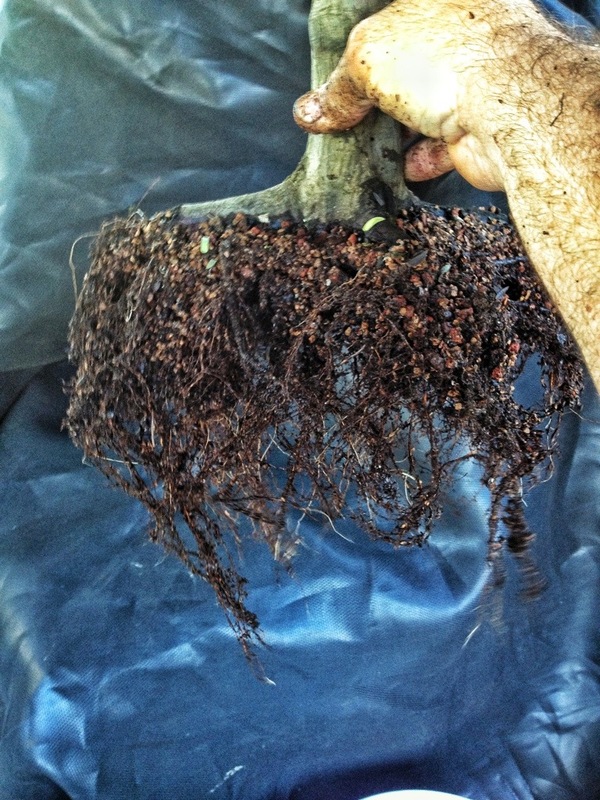 The big chunky roots provide no purpose except stability) and repotting at this time allows us to take advantage of the trees timing and not waste the plants energy by forming new roots twice (if we repotted too late) or of the cut ends rotting because transpiration is not occurring yet, moving water upward (repotting too early). Capice? 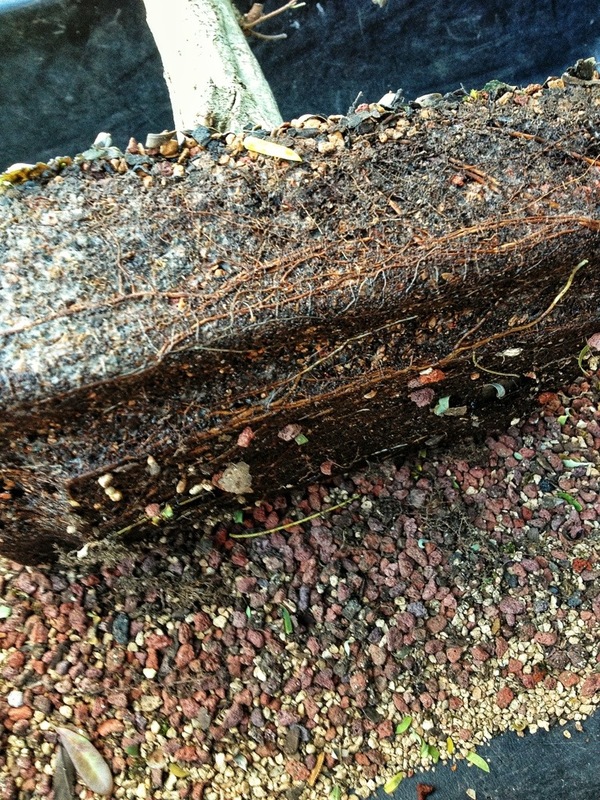 We have good root growth. 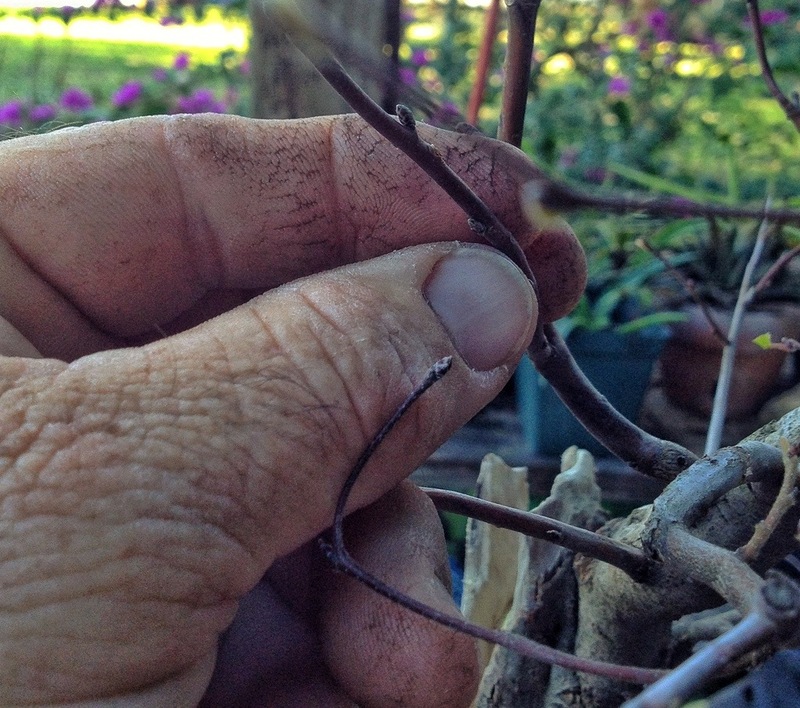 Trim it straight across so it can fit into the pot; removing the big roots as you go. Since I’m putting this into a new pot I will have to prepare it. Here are some shots of the deadwood to help you pass the time while I do that. Isn’t that a purty pot? As usual, I’ll post some pics as the tree develops. How do you like the black backdrop? We in the Artists Community call those “artistic folds”. Every still life you will ever see must contain them. It’s a Rule. May I ask a question regarding this species. You have written above that it had some die-back issues. 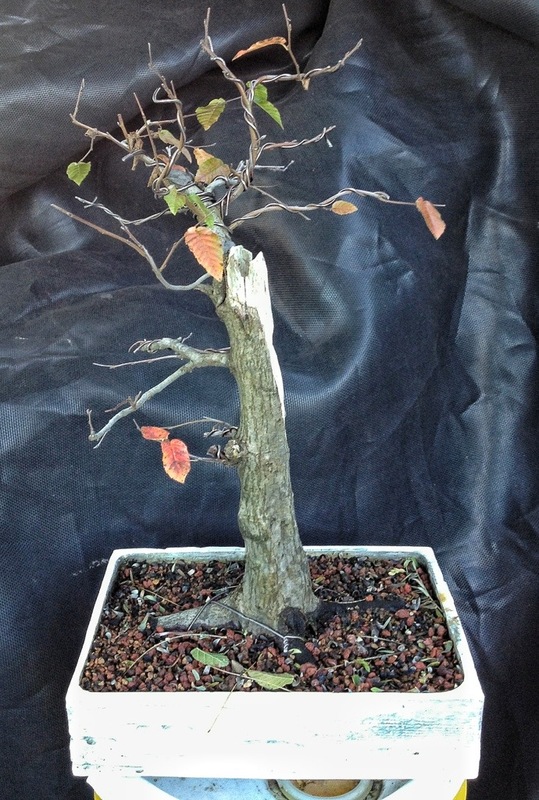 When do you recommend to chop down a tall ordinary nursery grown hornbeam to a height appropriate for bonsai? Is there any time inappropriate when the wood will die if cut? 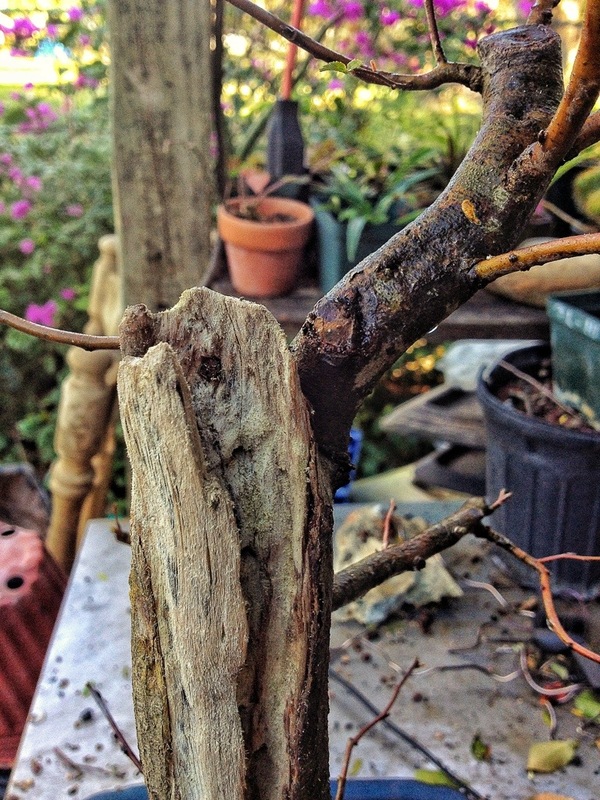 One friend of mine has experienced this die-back of the trunk when the tree was chopped down in autumn. The best time to cut it is in late winter.